If you enjoy the mild, nutty flavor of coconut as a snack in trail mix or maybe toasted and added to your favorite recipe, it's good to know the nutritional benefits of coconut flakes. Flaked coconut is one of several different forms of dried, unsweetened coconut. It's shaved into long, wide flakes that are larger than shredded or grated coconut. Coconut flakes are a healthy addition to your diet and a good source of manganese and other minerals. A quarter-cup serving of unsweetened coconut flakes, or 20 grams, contains 71 calories, according to NutritionalValue.org. Dietary Guidelines 2015-2020 recommends a daily caloric intake ranging from 1,600 to 2,400 calories for adult women and 2,000 to 3,000 calories for adult men, depending on age and level of activity. Most coconut flakes calories come from fat content. The total fat content in a quarter-cup of coconut flakes is 6.7 grams, with 6 of these grams being saturated fat. The American Heart Association warns that high levels of saturated fat in your diet can contribute to heart disease. However, the saturated fat in coconut is a medium-chain triglyceride fat, the type that is more easily absorbed and metabolized by the liver and less likely to be stored as fat in your arteries. A study, published in the British Journal of Nutrition in 2014, assessed the role of dietary coconut and its saturated fat content. Researchers classified coconut as a nutritious "functional food" that may be beneficial to Alzheimer's patients or people with memory impairment. 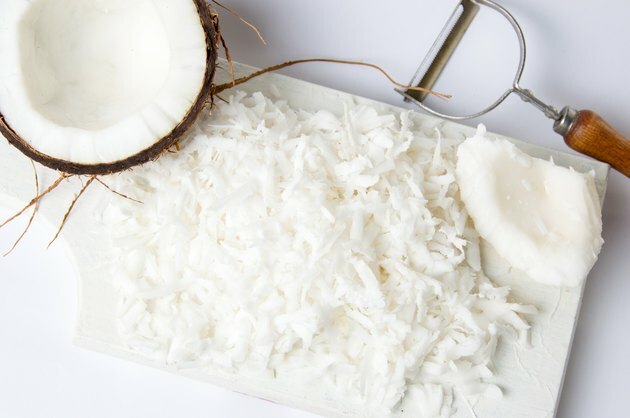 In addition, the study suggested that the benefits of coconut flakes may involve weight loss, maintaining cholesterol levels and reducing the risk of cardiovascular disease. In addition to fats, carbs and protein are essential nutrients needed to produce energy in your body. Protein is also important for maintaining muscle mass and producing hormones. Dietary Guidelines 2015-2020 recommends that you get 45 to 65 percent of your calories from carbs and 10 to 35 percent of your calories from protein. Carbs in coconut flakes amount to 3 grams <ahref="https: ndb.nal.usda.gov="" ndb="" foods="" show="" 12108?man="&lfacet=&count=&max=25&qlookup=flaked+coconut&offset=&sort=default&format=Abridged&reportfmt=other&rptfrm=&ndbno=&nutrient1=&nutrient2=&nutrient3=&subset=&totCount=&measureby=&Qv=.2&Q328828=1&Qv=.5&Q328828=1""> </ahref="https:>per quarter-cup. The protein content is 0.67 gram <ahref="https: ndb.nal.usda.gov="" ndb="" foods="" show="" 12104?man="&lfacet=&count=&max=25&qlookup=12104&offset=&sort=default&format=Abridged&reportfmt=other&rptfrm=&ndbno=&nutrient1=&nutrient2=&nutrient3=&subset=&totCount=&measureby=&Qv=1&Q328825=.25&Q328826=1&Q328827=1&Qv=1&Q328825=1&Q328826=1&Q328827=1""> </ahref="https:>for the same serving size. Coconut is a good source of manganese needed for healthy connective tissue, blood clotting and bone formation. Manganese also plays a role in carbohydrate and fat metabolism, mineral absorption and blood sugar regulation. Just a quarter-cup of shaved coconut provides 15 percent of your daily value for manganese. Phosphorus helps with the growth and repair of cells, tissues and bone. Coconut shavings or flakes contain 23 milligrams of phosphorus, or almost 3 percent of your daily value per quarter-cup. There is 0.5 milligram of iron — a mineral necessary for delivering oxygen to your muscles and organs — in each serving of coconut flakes. Sprinkling your unsweetened coconut flakes on a vitamin C-rich fruit for dessert will help you absorb the iron. Other minerals in coconut flakes include calcium, copper, magnesium, potassium and zinc. The vitamin content of coconut flakes is minimal with trace amounts of B vitamins — niacin, riboflavin, thiamin, B6, folate and pantothenic acid. Coconut flakes contain some dietary fiber — 1.8 grams per quarter-cup — to contribute to digestive health.